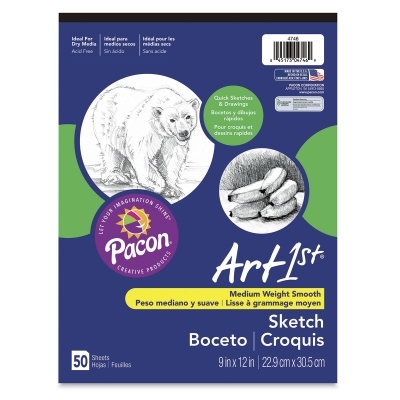 ART1st pads are an exciting new line of affordable art pads and sketchbooks for the student or beginning artist. The paper is artist quality with heavy chipboard backs and sturdy binding styles. All pads are tape bound and recyclable. The Sketch Pads are medium weight all-purpose white sulphite drawing paper ideal for experimentation with various art techniques. ® Pacon is a registered trademark.™ ART1st is a trademark.